Traditional tri-level in the desirable Foxridge community, featuring four bedrooms, three bathrooms, and a functional layout. Soaring vaulted ceilings and abundant natural light highlight the welcoming living room and adjoining dining room. Open and bright, all appliances remain in the sunny dine-in kitchen. Lower level family room maintains direct access to the covered patio, a cozy wood-burning stove, and a wet-bar with seating and rustic shiplap walls. Encompassed on the upper level are three bedrooms, including the generous master suite, and a full hallway bathroom. Finished basement is complete with a large rec room, the fourth bedroom, and flex space, ideal as an office or workout room. Mature shrubs and trees, a deck, a covered patio, a garden area, and a utility shed detail the private backyard. Residents are well-served by top-rated Cherry Creek schools. 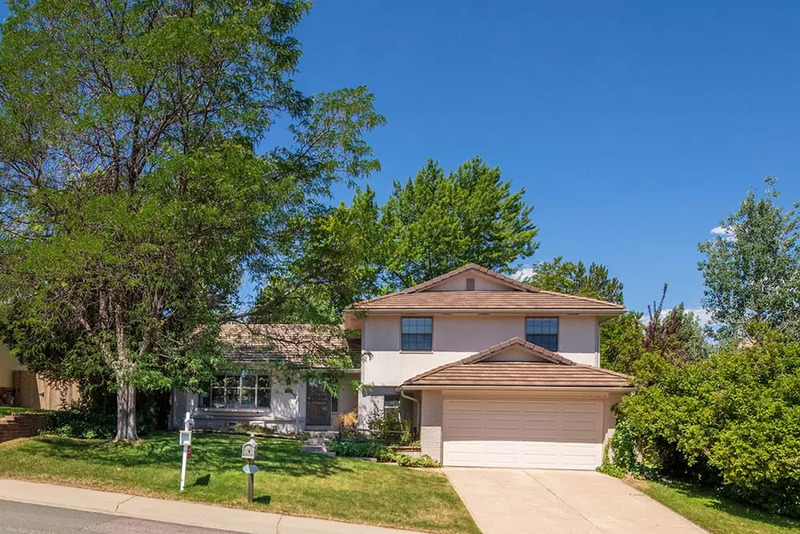 Remarkable central location, close to Willow Creek Trail and Foxridge Park, and just minutes to Park Meadows Shopping Center, the Denver Tech Center, I-25, and C-470!